Empower Salesforce CRM - Virtual Contact Center | 8x8, Inc.
Salesforce was named the #1 CRM Provider for the fifth consecutive year and is known as the number one system that integrates seamlessly with most cloud-based virtual contact center providers to provide businesses with a strong unified communication platform. The power of Salesforce Service Cloud or Salesforce Sales Cloud combined with a strong Virtual Contact Center can radically improve customer service for your business. Your selection criteria of a unified communication platform and a virtual contact center should make you consider a strong partner like Salesforce, which provides leading unified communication cloud-based solutions. A robust unified communication system integrated with Salesforce CRM can eliminate months of effort, cost while avoiding a steep learning curve. Still wondering why you should use Salesforce CRM? Keep reading. Clients seldom have the patience to go through your service team's script. Their data should already be on the system. They are calling to resolve a specific issue quickly and you can't afford to make them wait while your team members search for data. Nowadays clients expect your team to be fully knowledgeable about them and their issue. If your system is not at this level of integration and service delivery speed, you risk losing your clients, reducing your chance to cross-sell. Beyond this basic level of service expectation, matching the client with an agent who can best serve them can influence your bottom line profits, reduce the time spent serving clients, and improve customer satisfaction level. Flexibility, agility, continuous support, integrity control, business continuity, scalability, security, compliance, and the knowledgeable team working on your behalf are all factors to consider while you're researching the right solution for your business. An effective business needs analytics, granular reports, elastic search technology, flexible scorecards, and many other tools and features. For example, if you want to gauge the success of your agents, you would look for a system that shows you an agent-client call timeline, client and agent waveforms, screen recording features with insights into agents’ activities, as well as mentions and notation features throughout the call course. If you are used to working with detailed metrics and reports, look for a system with powerful and flexible pivot-table reports and trend analysis functionality. Such features and metrics spot strengths and areas for improvement instantly. Your lead generation and sales efforts are tied to your support after sales. Failing to meet clients’ expectations could impact your business' bottom line. Imagine a customer bought a product or acquired a service and contacts your call center to inquire about how to use the product. If they find themselves starting from the scratch as the call center agent creates their profile, that could reflect poorly on your business. The customer wants you to already be privy to their situation since they've purchased from you before. A strong cloud-based Virtual Call Center solution integrated with Salesforce CRM also reduces business running costs. Cloud-based unified communication solutions for your business eliminate hardware investments and provide a ready-to-go solution. Your job is to start configuration on the solution immediately to fit your business requirements and spend time-solving business problems that only you can work on, rather than spending time and money integrating your contact center with Salesforce CRM. 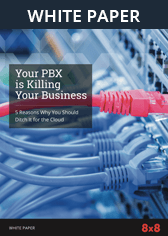 Keep in mind that VoIP solutions are hardware- and software-intensive and could be more expensive. Why Use Salesforce CRM Integrated with a Cloud-Based Virtual Contact Center? Single Sign-on: Reduce the number of passwords and authentication steps for your agents by allowing them to sign in only once on both solutions. This feature saves significant IT costs and support and eliminates one surface layer against attackers. Match Customers to the Right Agent: A Unified Communication solution with smart routing capabilities integrated with Salesforce CRM ensures client-call routing to the agent who can best serve them. Arm Agents with the Right Information: Based on the caller’s phone or other identification factors captured through IVR, Virtual Contact Solution should be able to show-up customer information directly to the agent screen. Better data: Your Unified Communication Solution should feature consolidated reports, with granular administrative details, and critical information that are available for people who need them through different communication channels. Automatic call logging: Your Unified Communication Solution should feature recorded call logging directly to client’s profile in Salesforce CRM. Your cloud provider and available features set directly affects your relationships with your clients, which directly affect your business' bottom line. 8x8 Virtual Contact Center is tightly integrated with Salesforce Service Cloud and Salesforce Sales Cloud. Choose a superior cloud system and ensure that this effect is for the better. Fill out our online form today or call us at 1-866-879-8647 to request a no-obligation quote from an 8x8 Product Specialist.